Come visit NMI at booth #1915 at TRANSACT April 30th - May 2nd in Las Vegas. TRANSACT is the place where financial institutions, networks, payments companies, FinTech and technology innovators gather to make deals that shape the industry. NMI enables thousands of forward-thinking ISOs, ISVs, VARs and Payment Facilitators to shift to a new Unified Commerce Strategy to achieve disruptive results. Our leading commerce enablement platform unifies every point of engagement – ecommerce, retail, mobile and unattended – to deliver a singular view of the customer from wherever the transactions take place. NMI CEO, Vijay Sondhi, will be participating in two different educational tracks during the course of the show. On Tuesday, April 30th at 11:00 am, he will be joined by Mastercard, First Data and FIS Global to provide insights on how customer’s mobile habits will determine the best ways to engage them to address rewards, benefits, and new products in the Driving Customer Value Through Mobile Payments 22nd Century Payments Track. On Wednesday, May 1st at 10:15am during the Payment Facilitator track, Vijay, Paragon Payment Solutions and Worldpay will take the stage to discuss a strategy for long-term success as a Payment Facilitator during the Launchpad for Market Growth: Understanding the Payment Facilitator Model track. 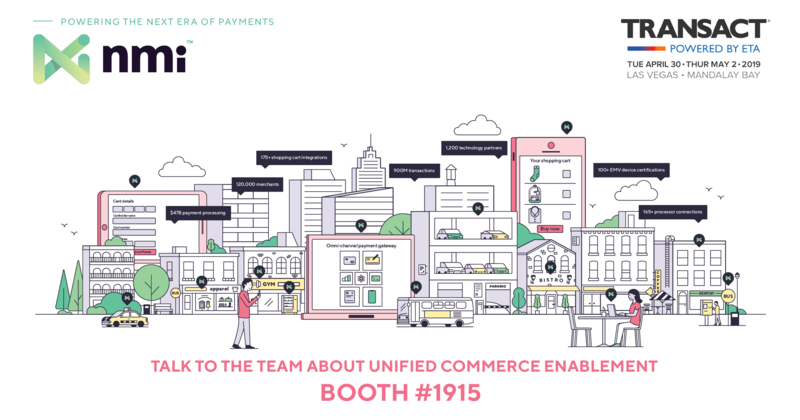 NMI is driving transformation in the payment industry through the power of Unified Commerce Enablement and we’re excited to share it with you. Stop by booth #1915 fill out the form below to set up a time to meet. See you in Vegas!